Heather O'Rourke, the child actress best known for her role as Carol Anne Freeling in the Poltergeist films, died 22 years ago today. Although I was not overly familiar with that series, I do remember reading about her death in the news back in 1988, chiefly because I was not very much older than her at the time of her passing. 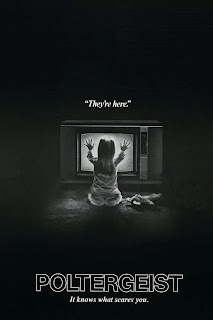 Her delivery of a single line from the first Poltergeist film, "They're here," became a staple of popular culture in 1982. Steven Spielberg co-wrote and co-produced the first installment, which spawned two sequels in 1986 and 1988. O'Rourke's death at such a young age, coupled with some other unfortunate and macabre coincidences, gave rise to an urban legend of the Poltergeist curse. Rest in peace. All these years later, I distinctly recall waking up to the news on my clock radio, informing me of O'Rourke's sudden demise. This was before I'd heard of any Poltergeist "curse", which I felt was a bit unseemly when people began discussing it. At any rate, I felt compelled to see the Poltergeist 2 that summer, which I believe was completed without O'Rourke.